Forming in the years prior to the city’s charter, Milwaukee’s insurance industry became a key part of the city’s economy while several Milwaukee insurance firms grew into significant regional and national industry leaders. The area’s insurance companies not only provided important protection against calamitous loss of life, property, wages, and other investments, but also played a significant part in shaping the landscapes of Milwaukee and surrounding communities. Although it is unclear precisely when the insurance industry first made an appearance in Milwaukee, experienced agents from New York, New England, and abroad were among the city’s earliest settlers. Seeing a promising insurance market in the bourgeoning frontier community, several hopeful pioneer entrepreneurs established satellites for major companies back East, or founded their own companies in Milwaukee during the 1830s and 1840s. Among the earliest of Milwaukee’s homegrown insurance firms was the Wisconsin Marine and Fire Insurance Company. Established by Scottish banker George Smith in 1839, Wisconsin Marine and Fire covered “buildings and ships against loss or damage on land or water.” This company augmented its local business by expanding into the Chicago market as well as dealing in real estate, offering advances on crops, and “other moneyed operations.” Wisconsin Marine and Fire also served several banking functions, such as receiving savings deposits, lending money, and issuing “certificates of deposit” that circulated as bank notes. In fact, banking eventually became the company’s primary concern, reorganizing as the Wisconsin Marine and Fire Insurance Company Bank in 1853 with Alexander Mitchell as president. The company later became the Marine National Exchange Bank and part of the Bank One Corporation. Prior to the widespread use of electric lights and steam heat, fire posed a particularly severe threat to the city’s predominantly wood-framed homes and businesses. Fire insurance became a key industry through the mid-to-late nineteenth century as a number of firms, including the Milwaukee Mechanics’ Mutual Insurance Company (established in 1852), Northwestern National Insurance Company (1869), and Concordia Fire Insurance Company (1870) followed Wisconsin Marine and Fire in providing residential and commercial coverage against the loss and damage from fire. Life insurance also became a significant part of the city’s industry, offering families financial compensation in case of the death of a policyholder. Milwaukee’s first life insurance providers were branches of major life insurance companies from New York, Philadelphia, and other industry centers back East. Founded in Janesville by an experienced New York life insurance agent in 1857, the Mutual Life Insurance Company of the State of Wisconsin moved its operations to Milwaukee in 1859. Later changing its name to Northwestern Mutual Life Insurance Company, this enterprise developed into Milwaukee’s largest insurance enterprise, and a national industry leader with agencies throughout the region and United States. Fraternal benefit societies within specific ethnic communities also organized to protect their interests. In 1868, Milwaukee’s Archbishop John Martin Henni and prominent area German Catholics established the Catholic Family Protective Association of Wisconsin (later Catholic Family Life Insurance) to provide financial security for working class Catholic families. In the late twentieth and early twenty-first centuries the organization merged with other similar area Catholic benefit associations, such as Northern Fraternal Life and the Catholic Knights, to form Catholic Financial Life, headquartered to this day in downtown Milwaukee. 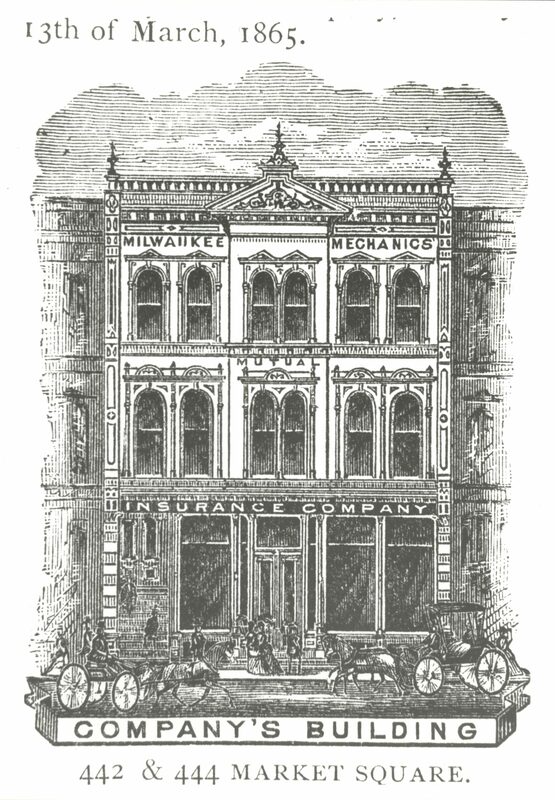 While now a significant national home and auto insurer, a group of local businessmen first established Badger Mutual Insurance as a mutual aid society in Milwaukee in 1887, providing fire insurance protection to area churches that were otherwise charged prohibitively high rates or denied coverage by other companies. Although Milwaukee remained the center of the area’s insurance industry, leaders in surrounding communities developed firms offering more localized services in the mid-to-late nineteenth century as well. Germantown Farmers’ Mutual Insurance Company (established in 1854), the West Bend, Polk, and Richfield Farmers Mutual Insurance Company (1880), and West Bend Fire Mutual Insurance Company (1894), for instance, covered farms, businesses, and homes throughout Washington County against property loss or damage from fire, flood, and other calamities. West Bend Mutual and Germantown Mutual remain significant local insurance providers offering a variety of lines of coverage. While fire and life coverage remained key products, new market demands and legally mandated requirements prompted the expansion of Milwaukee’s insurance industry through the twentieth century. Organized in 1892, the La Crosse Mutual Aid Association of La Crosse, Wisconsin moved its operations to Milwaukee early in the next century. Renamed the Time Insurance Company, the firm was a pioneer in the health insurance field and grew into a leading regional provider by the 1960s. The Dutch insurance company, N.V. AMEV, acquired Time Insurance in 1977, later changing its name to Fortis Health in 1997 and then to Assurant in 2004. In the early twentieth century, the Wisconsin State Legislature passed landmark labor reform legislation, the Workmen’s Compensation Act of 1911, that made employers more liable for any injuries or death their workers sustained on the job. The Unemployment Compensation Law of 1932, on the other hand, required employers to provide financial relief to their unemployed workers. As a result, several Milwaukee area insurance firms offered local employers worker’s compensation and unemployment coverage in addition to their property and life policies. As Milwaukee area residents increasingly owned and relied on automobiles for transportation through the twentieth century, area firms extended their product lines to cover damage and injury from commercial or individual vehicle collisions. The state legislature made auto insurance mandatory for Wisconsin drivers in 2010 after repeated attempts to pass such requirements in the state through the late twentieth century. Insurance also significantly promoted the development of the city and surrounding area. From the industry’s earliest days, firms such as Wisconsin Marine and Fire and Northwestern Mutual augmented their business through real estate investments and offering mortgage loans to local residents, businesses, and farmers. Established in Milwaukee in 1957, the Mortgage Guaranty Insurance Corporation (MGIC) was a pioneer in providing insurance to local and national mortgage lenders that allowed families to buy homes with a lower down payment. The industry also greatly contributed to the growth of downtown Milwaukee when firms built progressively larger office buildings as they expanded over time. The corporate headquarters of Northwestern Mutual and MGIC developed prominent parts of Milwaukee’s downtown skyline by the late twentieth century. Northwestern Mutual was also a major investor in the development of the Grand Avenue Mall in 1982 and other mixed-use projects in downtown Milwaukee in recent years. Insurance companies’ classifications of neighborhoods also helped institutionalize and reproduce class and racial divisions as companies “redlined” areas and denied coverage to poor and racial minority groups they deemed to be too high-risk. Major area firms like Northwestern Mutual, MGIC, Badger Mutual, and West Bend have survived over the decades and thrived despite various challenges into the mid-2010s. However, citing losses from greater national competition and policy changes in the implementation of the Affordable Care Act of 2010, Assurant Health announced the closing of its Milwaukee offices by the end of 2016. ^ Alice E. Smith, “Banking without Banks: George Smith and the Wisconsin Marine and Fire Insurance Company,” Wisconsin Magazine of History 48, no. 4 (Summer 1965): 271, 275. ^ Smith, “Banking without Banks,” 276-280; History of Washington and Ozaukee Counties, Wisconsin (Chicago, IL: Western Historical Company, 1881), 192-193. ^ “A Century of Banking in Milwaukee,” Bulletin of the Business Historical Society 13, no. 3 (June 1939): 47; “Bank One Collection,” Milwaukee County Historical Society, accessed June 29, 2016. ^ William George Bruce, History of Milwaukee, City and County, vol. 1 (S. J. Clarke Publishing Company, 1922), 373-376; Smith, “Banking without Banks,” 275. ^ John Gurda, The Quiet Company: A Modern History of Northwestern Mutual Life (Milwaukee: Northwestern Mutual Life Insurance, 1983), 8-9. ^ Gurda, The Quiet Company, 9-11, 19. ^ Wisconsin Department of Insurance, Annual Report of the Commissioner of Insurance of the State of Wisconsin (Madison, WI: Cantwell Printing, 1916), 306-313. ^ “Our History,” Catholic Financial Life, 2016, last accessed August 4, 2017. ^ “History: A Fresh New Spirit and Image—Still a Reflection of Our Heart,” Badger Mutual Insurance Company, 2016. ^ Carl Quickert, Washington County, Wisconsin: Past and Present, vol. 1 (Chicago: S.J. Clarke Publishing Company, 1912), 135; History of Washington and Ozaukee Counties, Wisconsin, 412, 723, 735-736. ^ West Bend Mutual Insurance Company, “West Bend’s 120th Anniversary,” accessed March 22, 2016; “About,” Germantown Mutual Insurance Company website, accessed July 6, 2016. ^ “Growth Is Fast at Time Insurance,” Milwaukee Sentinel, November 16, 1966, sec. 2, 4; “Time Insurance Co. Plans Holding Firm,” Milwaukee Sentinel, March 18, 1969, sec. 2, 5; Guy Boulton, “Assurant Health, Which Employs 1,200 in City, to Close in 2016,” JSOnline, June 10, 2015; “Assurant Company Timeline,” Assurant, Inc. website, accessed July 8, 2016. ^ “Assurant Company Timeline”; Rich Kirchen, “Hot Market for Health Insurer M&A Bodes Well for Assurant Health; Future of Employees Still in Doubt,” Milwaukee Business Journal, May 5, 2015; “Former Fortis Inc. Promotes New Name,” Milwaukee Business Journal, March 1, 2004. ^ Robert Ozanne, “Workers’ Compensation,” in Workers and Unions in Wisconsin: A Labor History Anthology, ed. Darryl Holter (Madison: State Historical Society of Wisconsin, 1999), 92; Robert Asher, “The 1911 Wisconsin Workmen’s Compensation Law: A Study in Conservative Labor Reform,” Wisconsin Magazine of History 57, no. 2 (Winter 1974-1973): 123-140; Irving Bernstein, “The Nation’s First Unemployment Compensation Law,” in Workers and Unions in Wisconsin, 124-125; Daniel Nelson, “The Origins of Unemployment Insurance in Wisconsin,” Wisconsin Magazine of History 51, no. 2 (Winter 1968 -1967): 109-121. ^ Paul Gores, “Mandatory Auto Insurance Begins June 1,” JSOnline, May 23, 2010; “Mandatory Auto Insurance from State Proposed in Bill,” Milwaukee Journal, January 24, 1969, sec. 1, 16; “Milwaukee Lawmakers Offer Best Bet for Mandatory Auto Insurance,” Milwaukee Journal, January 23, 1988, 6A. ^ Smith, “Banking without Banks,” 274-276; Gurda, The Quiet Company, 11, 27, 111-112. ^ “Our History,” MGIC Investment Corporation website, accessed March 16, 2016. ^ Gurda, The Quiet Company, 282-283; “News & Press Releases,” Northwestern Mutual Real Estate website, accessed April 25, 2016. ^ Gregory D. Squires, “Insurance Redlining: Still Fact, Not Fiction,” National Housing Institute, Shelterforce Online, no. 79 (February 1995), now available at https://shelterforce.org/1995/01/01/insurance-redlining-still-fact-not-fiction/, last accessed August 4, 2017; Gurda, The Quiet Company, 18. ^ Boulton, “Assurant Health, Which Employs 1,200 in City, to Close in 2016”; Guy Boulton, “Milwaukee-Based Assurant Health to Be Sold Off or Shut Down,” JSOnline, August 28, 2015; Kirchen, “Hot Market for Health Insurer M&A Bodes Well for Assurant Health; Future of Employees Still in Doubt”; Rich Kirchen, “Assurant Health Wind-down on Pace for 2016 Closing,” Milwaukee Business Journal, February 10, 2016. Asher, Robert. “The 1911 Wisconsin Workmen’s Compensation Law: A Study in Conservative Labor Reform.” Wisconsin Magazine of History 57, no. 2 (Winter 1973-1974): 123-140. Nelson, Daniel. “The Origins of Unemployment Insurance in Wisconsin.” Wisconsin Magazine of History 51, no. 2 (Winter 1967-1968): 109-121. Smith, Alice E. “Banking without Banks: George Smith and the Wisconsin Marine and Fire Insurance Company.” Wisconsin Magazine of History 48, no. 4 (Summer 1965): 268-281.